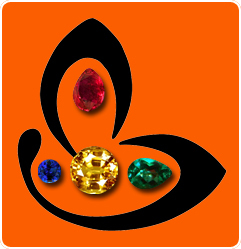 Comments Jyotish quality gemstones are a blessing to humankind. The net of Karma is cast strong and one cannot but be caught up in the process of karmic balancing of books. While the few other means have their own pitfalls and traps, planetary gem therapy ensures that life is interspersed with many more pleasant experiences on the road to realising ones destiny. Click here to read more on this. Featured today is a fine gem – a natural and treatment free imperial golden yellow topaz of 2.81 carats set as a twin leaf hope ring. 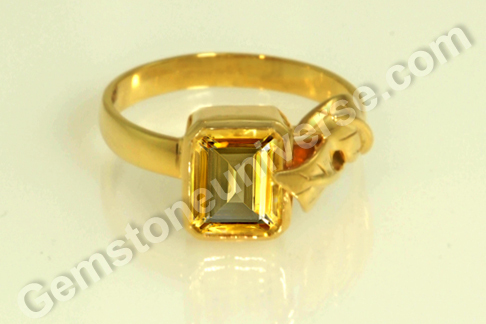 The classic emerald cut yellow topaz has the fine sherry color and is eye clean. The natural Imperial topaz from Brazil has good jyotish weight also. Imperial Golden yellow topaz is the substitute gem for natural yellow sapphire or pukhraj gemstone and has the planetary energies of Jupiter/ Guru/ Brihaspati residing in it. Golden Topaz is generally regarded as the birthstone of the month of November in the West. The Yellow topaz is often wrongly confused with citrine, which is a gem of the Quartz group. is the ring made of gold ? and what is the size of ring ?